The field of nanoscience has undergone tremendous growth in the past decade as the number of applications of nanoparticles and nanostructured materials have proliferated. Metal nanoparticles have attracted particular interest due to their potential for applications in areas as diverse as catalysis, medicine and opto-electronics. The chemical and physical properties of metal nanoparticles can vary smoothly or discontinuously with nanoparticle size, depending on the size regime and the property. In the case of bi- or multimetallic nanoparticles ("nanoalloys"), these properties also depend on the elemental composition and the chemical ordering – how the metals are distributed in the nanoparticles.It is this tunability of behavior that makes metal nanoparticles and nanoalloys so versatile and appealing. This book begins with a tutorial introducing the theoretical ideas and models that have been developed to understand metal nanoparticles. 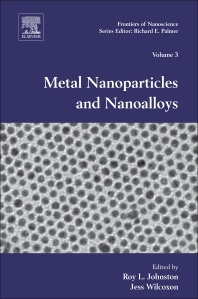 It gives an overview of experimental methods for generating and characterizing metal nanoparticles and nanoalloys and of their properties and applications, providing an introduction to material covered in more depth in subsequent chapters. A major theme of all the chapters is the effect of nanoparticle size, shape and surface chemistry on their properties – especially optical and catalytic properties. Roy Johnston is Professor of Computational Chemistry and Deputy Head of School at the University of Birmingham, UK. Roy has published over 150 research papers in scientific journals as well as reviews and book chapters in the fields of computational nanoscience and applications of nature-inspired computation. He has edited several volumes, including the volume Metal Nanoparticles and Nanoalloys for this series, and special issues of journals.